(2 Customer Reviews) | Write Review 12 issues per year Android Advisor is your go-to source for everything Android, from smartphones, tablets and the best mobile apps to wearable and in-car tech, optimised for the small screen of your mobile device. Whether you're new to the Android operating system or a seasoned user, you're sure to find something you like in Android Advisor's wealth of analysis, reviews, features and tutorials. Android Advisor will not only help you to choose the best phone or tablet for your needs, but also to get more out of that device. You'll receive 12 issues during a 1 year Android Advisor magazine subscription. 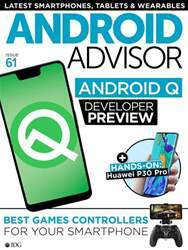 If you are considering a new android device or just an android or tech addict this is the mag for you. You'll receive 12 issues during a 1 year Android Advisor magazine print subscription.